Here's the next batch. Hopefully the apostrophes don't screw things up this time. I specifically went through them and changed them from the google drive version. If that doesn't work, I'll go with my backup plan. After Chrys'tel was kicked out of the party by Erusa'kel for not having an invitation, he sympathises with her since it happened to him too. After Ran'dirrk's failed attempt to kill Snad, Kale'shido witnesses Sindas carrying Kiel and Njack tagging along with them. During the speech after Snad explains the poison, he said that poisoning Valla'drielle would only make the Kyorl'solenurn fight harder before Snad shocks him and Greas'pa by swallowing the poison. When Shodun gave the command, he kneeled. 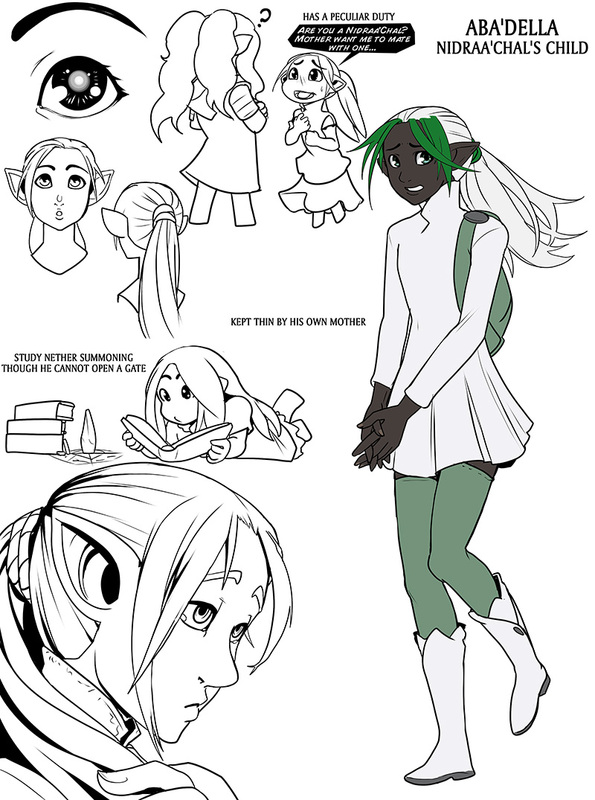 Aba'della wears a white skirt, white boots and long green socks. He also carries a green bag. His white hair is partly dyed green and is worn in a ponytail. He has a thin frame as a result of his mother keeping him thin. When Kharla was gorging food at the buffet, Ash'mita leads Aba'della away from the scene. She takes him to search for Snadya'rune, where she comments to him about the fact there are lots of people around Snadya'rune. He tries to encourage Ash'mita to talk to Snad but she declined, stating that Snad appears to be busy with the other people. he was later present during Snad's speech, remaining close to Ash'mita and kneeled when Shodun gave the command.
"'' -Should we retire to a bedroom, to...- ''" Trying to convice Ash'mita to mate with him. 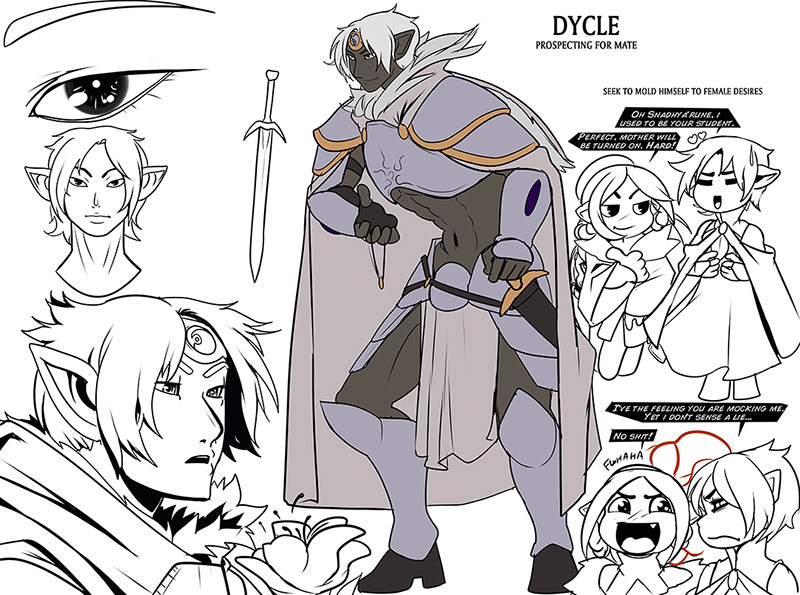 Dycle is looking for a mate and to that end, he wears revealing and ultimately impractical grey armor. He wears a cape over it and also has a jewelled headpiece. He and Araa'toskr were witnessed by Ash'mita and Aba'della discussing something before the three were interrupted by Kiel. After the airship arrives, he states that he’d love to see the Mimian's tree being bombarded from above. After Jiann was shown to Snad, she asks Dycle to fight Jiann, promising Dycle that she would allow him to court her if he kills Jiann. Dycle lost the fight and died. "''Courting, my lady. I only expressed the desire to court one as beautiful and smart as you.''" During the conference, after Ran'diirk's failed attempt to kill Snad, she shows surprise at the summons everywhere. She was later present during Snad's speech where she was surprised by the appearance of the airship. After the fight between Jiann and Dycle, Minalia decides to kneel and pledges herself to Snad declaring Snad should rule.